As I documented in this earlier post, third party data continues to confirm that VMware View is the leading desktop virtualization solution in the market. 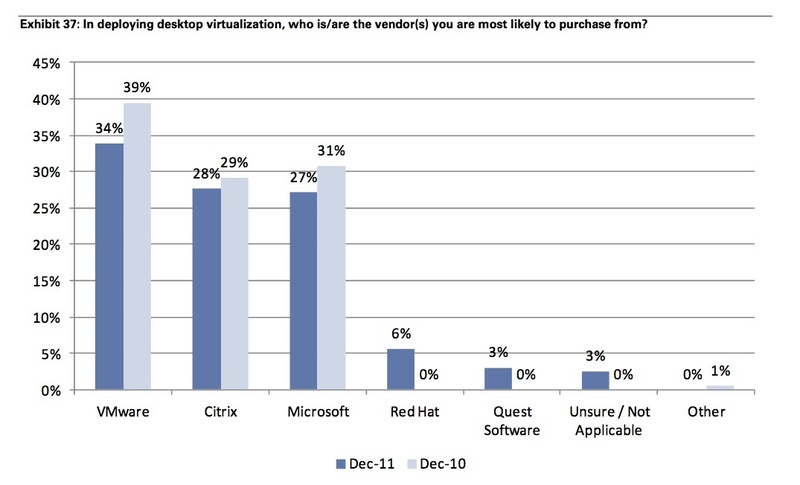 In the latest report from Goldman Sachs titled “TMT Desktop: Secular themes persistent, despite volatile macro tide” and published on February 12th 2012, VMware View continues to be the Desktop Virtualization solution that is most likely to be adopted in the market. This is a trend that has been consistent since 2008 the year after VMware invented and launched the first VDI product and it has resulted into increasing View momentum and and most importantly great customer references.